I got to know Anne Bardsley in a Facebook Group we’re both members of and I know for sure I cannot wait to meet her in real life! We have so much in common and during a recent phone call I found out she grew up in Wayne, Pa. and I had been in Wayne that day for lunch. She lives in a Florida beach town now and plans to do only 3-things a day and one of them is to go to the beach! I’m looking forward to her coming ‘home’ for a few book signings. Anne gets up at 4:30 am while it’s peaceful and quiet (until she cracks herself up) to write in her sunroom. 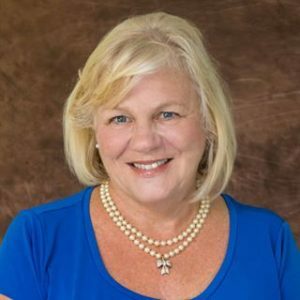 While attending Toastmasters, Anne’s mentor asked, “What will you do this year?” When it was Anne’s turn to answer she blurted out, “I’m going to write a book.” She thought, OMGoodness I said it out loud now I have to do it and that is exactly what she did. I hope you enjoy getting to know Anne and I highly recommend her second book, Angel Bumps Hello from Heaven. I’m looking forward to reading her first book too. Angel Bumps is a collection of stories that will console anyone who has ever lost a loved one. Each author shares a sign from Heaven that reassured them their loved one is still near in spirit. After reading Angel Bumps, you might want to keep your eyes open. Be aware. An angel bump can come when you least expect it! 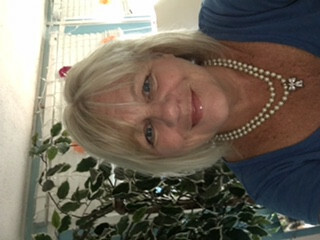 Anne Bardsley is a humor and sentimental writer. 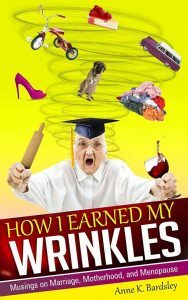 She has been married for 39-years to her wrinkle-maker husband. She has five-grown children and four- beautiful grandchildren who keep her young. She’s been featured on Erma Bombeck, Better After 50, Purple Clover, Paradise News, Very Funny Women, Island Reporter, Feisty after Fifty, Midlife Menopause, The Grand Magazine and many others. Where did you grow up, any siblings and did you grow up in a reading or a writing family? I grew up in Wayne, PA. I have three sisters. I remember reading on rainy days on our front porch. I remember writing in school and getting compliments from the sisters. You live In Florida now; how did you, your family and your home fare before during and after Irma’s visit? I live in St Pete now, 4 minutes from the beach. We prepared for Irma, but had no damage, thank goodness. Only two trees came down in the back yard. 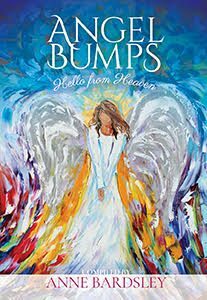 Judging from the number of stories in ANGEL BUMPS there are so many who want to share their angel stories. Those of us who ‘believe’ are not considered so strange any more. How difficult or easy was it to get submissions? It was actually easy to collect Angel Bumps stories. I’d tell a friend a story and she’d tell her friend and that friend knew of someone who had an experience. Quite a few of my Erma Bombeck Writing Conference friends had stories. They came flowing in, one at a time. They’re still coming in. I started a new FB page for people to share their Angel Bumps stories. I want it to be an uplifting place for people who are grieving. The page is Angel Bumps, Hello From Heaven. Angel Bumps was #1 Hot New Release on Amazon when it was first released. Tell us what inspired you to write Angel Bumps? Angel Bumps was inspired by a sign from my mom. When I’d tell people the story, they’d say they got goose bumps. I’d tell them they were angel bumps, an angel’s wing had just brushed by them. The story seemed to touch people. I think if the book can help someone heal, we’ve done our job. It’s not a miracle cure for grief, but it does have stories that prove we are never alone. Loved ones are near. People die, but love is eternal. My first published piece I believe was in a local beach magazine for Easter. I wrote a story about my husband buying me Easter flowers. I expected a hanging basket. He arrived with a 4 ft cemetery cross. He thought it was a portable garden because it had a stand. That story is in my first book. Tell us about your first book? Buying the best bathing suit of my life and then saw the maternity tag. Worse yet, it fit!! Calling my GYN instead of my dentist and asked them for an appt to fill a large cavity. Stories of tricks we played on our teens. 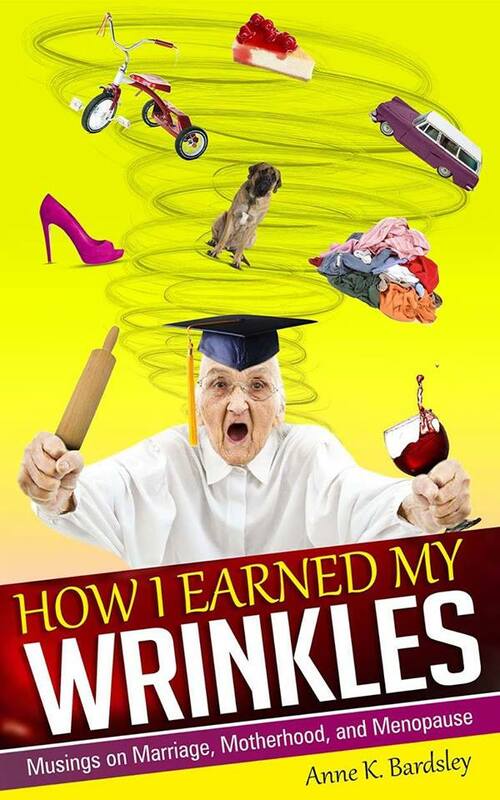 Real life fun stories and I was thrilled with the 5 star reviews! Is there a book three in your future? I need to write another humor book, as well. Do you live with a pet? I have a cockapoo named Miss Mattie. She is more like a cat. She loves us, and then when she’s had enough, she retreats to her bed. Favorite holiday has to be Christmas. I love finding little unique gifts. I miss the snowstorms (only during Christmas) and I am addicted to Hallmark Christmas movies. I’m a white zinfandel girl, but a few of my friends and I have joined a wine tasting club nearby. I’m learning to like some reds. Who knew I could sing when I drink red wine? Coffee……I grew up on tea. To this day if something bothers me, I’ll have a cup of tea. I wasn’t sure I would be able to get through this one because I’ve lost so many loved ones. Although I cried while reading some of the soul felt stories they were warm and happy tears. Reading left me with a comfort I haven’t felt in a long time. It’s so nice to know I’m not the only one that believes and has experienced many Angel Bumps. I highly recommend this one to anyone that needs to read a feel good book. Oh my goodness! The filling a large cavity comment is hilarious! Sounds like an interesting book. Great interview, Doreen. I love her inspiration.I, too, know that we are never without our loved ones who have crossed over.